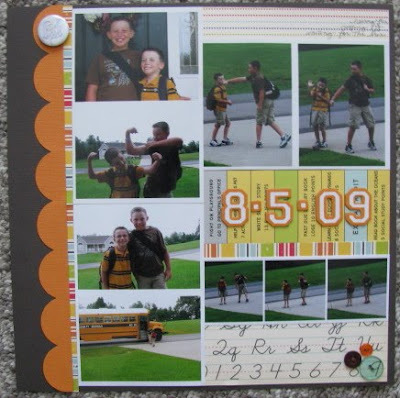 I've been able to scrap a few more layouts with the Personal Scrapper September kit over the past couple of days. I am determined to use it up before I move on to other supplies. First, I was inspired by an April '09 PageMaps sketch. I made a few changes, but love how this turned out. 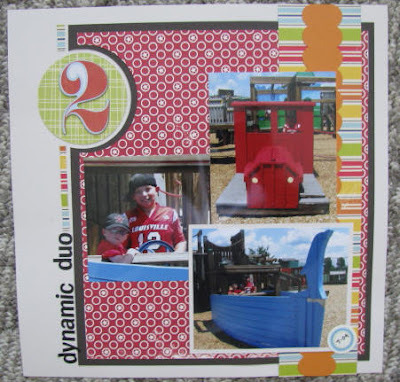 In addition to the kit items, I added a Sassafrass Lass chipboard "2". This page is for Kevin's album. We went to a local playground a few days before school started and the boys had fun goofing off. This 2-page layout finishes up Kevin's outing to the playground. I added some Thickers and Jenni Bowlin crepe paper ribbon. This is a happy page. I still had Blake's photos from the first day of school to scrapbook. I loved the "textbook" looking patterned paper, but found it a little hard to use. I cut it down and turned it on it's side. 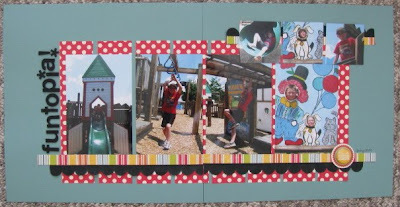 Then I cut the scraps down to thin strips and used the reverse side to make a border around the page. Finally, I just added scraps of other patterns until I was happy with the look of the page. I added Scenic Route and Sassafrass Lass chipboard and Jenni Bowlin stickers. Finally, I had Blake's photos of the boys goofing off before getting on the bus the first day of school. I used some more scraps from the kit for this page. I added a few buttons and some cool Letterman Thickers.